For other places with the same name, see Atlanta (disambiguation). Atlanta  is the vanguard of the New South, with the charm and elegance of the Old. It is a city that balances southern traditions with sleek modernism. In 2016, Atlanta had 472,522 residents residing within the city limits and nearly 5.3 million in the entire metro area. In Atlanta, the peach trees are plentiful and the tea is sweet, yet this city boasts three skylines and the world’s busiest airport. Atlanta has been burnt to the ground and built back up; it has seen the horrors of war and felt the pain of droughts and floods. Atlanta knows rebirth and endurance though, perhaps better than any other city. Atlanta was host to the 1996 Centennial Olympic Games, is the capital of Georgia, and has become the enduring leader of the American South. The separated skyscrapers of Downtown, Midtown, and Buckhead make Atlanta’s three skylines, and the size of any one of these districts could rival the center of any other city in the South. Atlanta is not all high rises though; each of the city’s urban neighborhoods offer unique atmospheres that are well adapted to living in the shadow of the city. Just North of Downtown, this is a major business and residential district with tall skyscrapers and a popular nightlife area. This district also includes Piedmont Park, the Woodruff Arts Center, and the Georgia Tech campus. Located several miles North of Midtown, Buckhead is a popular business and nightlife district. Buckhead is surrounded by neighboring Brookwood Hills, as well as Peachtree Battle, Lindbergh Center, and the Governor's Mansion. The alternative shopping district Little Five Points is bordered by the trendy Virginia Highland, Old Fourth Ward, Inman Park, and Candler Park neighborhoods. Further south lie milltown communities and historic streetcar suburbs like Cabbagetown, Reynoldstown, Edgewood, and East Atlanta. Home of the city's first park (Grant Park) and neighboring Victorian homes, as well as the busiest airport in the world, Hartsfield-Jackson Atlanta International Airport. South Atlanta also contains the neighborhoods of Mechanicsville, Peoplestown, and Lakewood. The city of Decatur is only a few miles from downtown Atlanta, but has held on to its residential small-town charm. One of the most pedestrian-friendly areas in Atlanta, Decatur is home to many excellent restaurants, bars, and boutique shops. Located on the Piedmont Plateau in the Northern Georgia, Atlanta is located almost entirely in Fulton County, while a part of the city limits extends into DeKalb County. The area size of the city limits is only 132 sq mi (343 km²), but Metro Atlanta which includes 28 counties has an area of 8,376 sq mi (21,693.7 km²). The Chattahoochee River, which forms the Northwestern boundary of the city limits of Atlanta, is a major source of water throughout the metro area. Aside from the river, the topography of Atlanta is assorted with rolling hills, forests, lakes and ponds, and granite Stone Mountain to the east. Atlanta is on the Piedmont Plateau, at an approximate elevation of 800 ft - 1900 ft (240 m - 580 m) above sea level. The city is thus somewhat cooler than other places in the US South, a fact that certainly helped the growth of the city before the introduction of air conditioning. Atlanta experiences a very wide range of temperatures. Temperatures in winter are overall mild to warm, but cold-fronts can bring light accumulations of snow and lows occasionally plummet into the teens. However, winter days are usually in the 50's and nights in the low to mid 30's. Ice-storms are very rare, but not unheard of. Summers are hot and humid, with temperatures frequently reaching above 90°F (32°C), thus the city earning the nickname "Hotlanta". Rainfall is high in late winter and early spring, and afternoon thunderstorms are common in summer. Spring and autumn are the best times to visit. The region is often affected during hurricane season (June 1 to November 30) from remnants that spill out from the Gulf, bringing heavy rains and sometimes high winds. Atlanta began taking substantive shape in 1837 when the Western & Atlantic Railroad selected the site as the Southern end of its tracks. The town was called Terminus until 1843 when it was renamed Marthasville after the daughter of Gov. Wilson Lumpkin. In 1847, the city was renamed Atlanta, supposedly a feminine form of "Atlantic" probably created by an engineer with the Western & Atlantic. The city was incorporated in 1847. By the outbreak of the Civil War in 1861, Atlanta was a major railroad hub, manufacturing center, and supply depot. But, in 1864, in order to cripple transportation between the South and the North, Union General William T. Sherman's army burned all of the railroad facilities, almost every business and more than two-thirds of the city's homes to the ground during his infamous "March to the Sea." Atlanta lay in ruins, the only major American city ever destroyed by war. Atlanta's first resurgence began soon after. Within four years of Sherman's attack, the Georgia capital was moved from Milledgeville to Atlanta and a drive to attract new business was underway. In the meantime, college and universities began to open, telephones were introduced, and trolleys began to roll. In 1895, the Cotton States and International Exposition in Piedmont Park showed 800,000 visitors and residents that Atlanta was headed in a new direction and braced for the 20th century. By the late 1920s, a downtown business sector had taken shape, giving Atlanta much of the distinct pattern it maintains today. At the same time, Atlanta Alderman (and later Mayor) William B. Hartsfield campaigned long and hard to convince the city to turn a vacant racetrack into an airport. Today, Hartsfield-Jackson International Airport is the world's busiest airport, with more than 80 million annual passengers. While the city continued its economic surge, it also became known as the "City Too Busy to Hate." Atlanta and Georgia preempted much of the strife associated with the 1950s and '60s by taking the lead in the Southeast in strengthening minority rights. The city's strongest identification with the movement was through its native son, Dr. Martin Luther King, Jr.
Much has been accomplished in the last 25 years to elevate Atlanta to a higher stage in the nation. An efficient public transportation system, MARTA, was put in place, Underground Atlanta was added, the Georgia Dome was built in 1992, and Philips Arena was built in 1999. 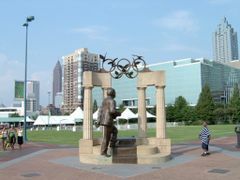 From July 20 through August 4, 1996, all eyes were on Atlanta as it hosted the Centennial Olympic Games. The city successfully hosted the biggest Olympic Games ever, showcasing itself to 2 million people in person and 3.5 billion people through global broadcast. Most recently, Atlanta has become a major conference and convention destination, due mostly to the enormous airport and being the financial hub of the South. Most of the conference venues are located around the Peachtree Center MARTA station in downtown, and when there is a large show in town. Atlanta’s southern culture, deep history, and bustling city have been the backdrop for numerous classic films. Gone with the Wind (Victor Fleming, 1939). Steeped in Confederate politics, a struggle for survival, and unavoidable love intrigues, this film has the rare distinction of being as good as if not better than the classic southern book it is based on. Driving Miss Daisy (Bruce Beresford, 1989). This film tactfully explores the racial issues of the civil rights-era through the nuances of a relationship between a wealthy white woman and her black chauffer. ATL (Chris Robinson, 2006). A coming of age drama set in the hip-hop culture of the modern city. Atlanta is also the background for the popular television shows "The Walking Dead", "Real Housewives of Atlanta", "Single Ladies", "Drop Dead Diva" and "Love and Hip Hop: Atlanta". Atlanta's principal airport is Hartsfield–Jackson Atlanta International Airport (IATA: ATL ICAO: KATL)  ("Hartsfield–Jackson," "ATL," or just "the airport" to locals), located about 8 miles south of downtown. Hartsfield-Jackson has been the world's busiest airport since 1998, and is a major hub for Delta Air Lines and Southwest Airlines. However, its efficient layout means it is also easy to navigate and not as delay-prone as many other hub airports. 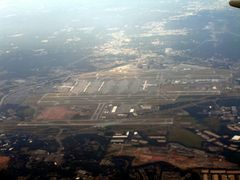 On the domestic side, Hartsfield–Jackson is one large building separated into South Terminal (Delta and its partners) and North Terminal (all other airlines), connected by a central Atrium with a smattering of restaurants. The security line is through the Atrium, and because it is centralized, is usually fast; you can check current wait times at . The gates are in 7 concourses; in order they are T, A, B, C, D, E, and F. To go between concourses, you take an escalator down to a long underground hallway, and take the fast Plane Train, or walk (it's about 1000 feet between each concourse). It's never necessary to leave and then re-enter security, and tight connections are very feasible, assuming you arrive on time. Concourses E and F are the international concourses, and are where you will go through customs and immigration when arriving from abroad (unless you connected from another U.S. airport). You can be picked up by car directly from the international terminal, or take taxis or some shuttles. For all other ground transportation (rental cars, public transit, and more shuttles), take the free shuttle connector to the domestic terminal or car rental center. When departing on an international flight, you should likewise get dropped off or return to the international terminal to check in. 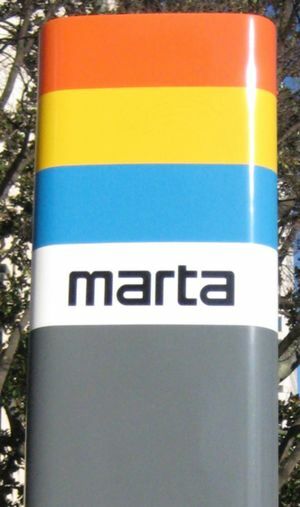 Hartsfield–Jackson is the terminus of the southern branch of MARTA, the city rail system (see Get around below). For travel to downtown, midtown, or northern Atlanta, this is a convenient and economical way of getting there, although usually one of the slowest. Most MARTA stations have taxi stands, and some hotels have free shuttles which will collect from the nearest MARTA station on telephone request. Other ground transportation options include taxis, shuttle vans to certain hotels and conference centers, and a car rental center. Taxis are fixed-rate when going to/from the airport and major business areas (Downtown $30, Midtown $32, Buckhead $40; excluding fees); be sure to insist on this fare. The airport is easily accessible from the highways (I-85 for domestic terminals, I-75 for international terminal), and driving or being picked up is one of the fastest ways to or from the airport—just beware the surly police officers who will not let cars linger in the drop-off/pick-up zones. Although the airport has all the conveniences you'd expect (several for-pay WiFi providers and free access to a few Atlanta web sites, an assortment of slow overpriced restaurants, etc.) there is not much else to see or do. If you find yourself with free time, go contemplate the Zimbabwean stone statues in the underground corridor between Concourses T and A, or check out the scenery in brand-new Concourse F. There are good restaurants scattered throughout the airport; but, if you have ample free time (and we do mean ample), go to Concourses E and F (the international ones) for a better selection of restaurants and nicer atmosphere. The USO has a lounge outside security upstairs from the domestic Atrium (M-F 7AM-9PM, Sa 7AM-6PM, Su 7AM-8PM). Atlanta is the largest business center in the American South and one of the largest media centers outside of New York and Los Angeles. Due to the high congestion at KATL, there are several airports that focus on business and leisure aviation. Dekalb-Peachtree Airport (IATA: PDK) (ICAO: KPDK)  is located within "the Perimeter" in Chamblee, Georgia. Although shuttle flights are available to Cincinnati, Memphis, and Destin, PDK primarily serves as Atlanta's main business jet hub with 4 runways and 3 private terminals. There are 5 additional airports offering private terminals located just outside of the perimeter: Fulton County Airport (IATA: FTY) (ICAO: KFTY); Cherokee County Airport (ICAO: KCNI); Falcon Field-Atlanta Regional Airport (ICAO: KFFC); McCollum Field-Cobb County International Airport (ICAO: KRYY); and Gwinnett County Airport (IATA: LZU) (ICAO: KLZU). Air charter companies including Priority Jet  and Georgia Jet Charter  offer access to a variety of aircraft rentals based at Atlanta-area airport, with planes ranging from economical single and twin-engine propeller planes, to wide-cabin business jets and luxury Gulfstreams. Atlanta is served by Amtrak  1-800-872-7245. Amtrak's Crescent train runs daily and serves New York, Philadelphia, Baltimore, Washington, Charlotte, Gainesville, Birmingham and New Orleans. Southbound, the train leaves New York just before 3PM, calls at Atlanta at around 9AM the next day and reaches New Orleans by 8PM. Northbound, the train leaves New Orleans at around 7AM, calls at Atlanta at around 8PM and reaches New York by 2PM the next day. The Atlanta Amtrak station is located at 1688 Peachtree St. N.W., which is several miles north of downtown and the airport. To connect from MARTA, take bus #110 or walk about 20 minutes from the Arts Center Station. Arriving Amtrak passengers can pay $2.50 in exact cash to get on the bus. The stop on the same side of the street goes south to the Arts Center, or cross the street to connect with a northbound bus to the Buckhead Station. There is no on-site parking at the Amtrak station, but Elite Parking  has a surface lot nearby and offers longterm parking at reasonable rates. Greyhound Bus Lines , 1-800-229-9424, provides bus service to Atlanta from many locations throughout the United States. Buses arrive at and depart from the Greyhound terminal at 232 Forsyth Street, located in a less affluent neighborhood on the southern edge of the downtown area and directly beneath MARTA's Garnett Station (see 'Get around' below). Bus Bank , 866 428-7226, charters buses and can help plan an itinerary for you or your group when visiting Atlanta. Bus Bank can take you to a number of Atlanta attractions including Olympic Centennial Park, Martin Luther King Jr. National Historical Site, Civil War Museum, Georgia Aquarium, and more locations including university visits. Atlanta is linked to the rest of the US by the Interstate Highway System. The principal interstates serving the city are I-75 (serving traffic from Detroit to Florida), I-85 (connecting the Mid-Atlantic to Montgomery) and I-20 (connecting Texas to South Carolina), all of which cross through Downtown. I-285 (commonly called the Perimeter by Atlantans, and the Atlanta Bypass on overhead signs) circles the city at a distance of about 10 miles out, crossing and connecting with all the above freeways as well as the airport. Free real-time traffic information is available by dialing 511 anywhere in the state of Georgia. There is a Park&Ride carpark in North Springs MARTA station (and other locations) which means one can park one's car (for free if < 24 hours) and take the train into Atlanta center. North Springs is useful if staying north of Atlanta. On a weekday I found the vast car park to be completely full (all ~6 stories). It took 30 mins of driving around before I found a space. Take a (yellow) ticket on the way in from the Georgia 400 expressway [Exit 5c - well signed] and use the same ticket at the yellow/Georgia 400 exit to leave (going north only). Parking is free and no validation of ticket is required if < 24 hours. Although most locals rely on their cars for day-to-day transportation, walking, biking, and public transit are well suited for visitors. The major intown neighborhoods are quite walkable, and many attractions are easily accessible from public transit. If you'll have a car anyway, driving is often the fastest means of getting around. It also opens up destinations that are difficult or impossible to access by public transit. However, having a car in Downtown or Midtown is often a hindrance where parking is scarce, and the lengthy rush hour is an exercise in frustration. Visitors will find today's Atlanta very walkable, with many improvements made in the last decade. Most of the intown neighborhoods are individually easy to walk around, with dense collections of bars, restaurants, and shops. In particular, getting around within Midtown, Downtown, Decatur, Buckhead, or the areas around the North Highland Avenue corridor in Eastern Atlanta (including Virginia-Highland, Poncey Highland, Inman Park, and Little Five Points) is usually quite easy; walking times rarely exceed 10–20 minutes, and buses or trains provide some relief for longer trips. Getting between those neighborhoods solely by foot is more difficult; for example, expect a 30–45 minute walk between Midtown and Virginia-Highland. The Atlanta BeltLine, a former 22-mile railroad loop around the city, is in the process of being converted to pedestrian-friendly trails, parks, and public transit. The loop of Atlanta Beltline trails provides a quick and convenient walking or biking connection between many neighborhoods. Beltline trails currently exist on the east, west, and north side of the city, stretching a total of 2.3 completed miles. Be sure to check on the Atlanta BeltLine website about completed bicycle/pedestrian trails. The PATH Foundation has built over 180 miles of trails in Georgia, many of which are in the Atlanta area. PATH Foundation trails include a connection between Centennial Olympic Park and Stone Mountain, 19 miles away. Other local trails include the Trolley Line Trail in Kirkwood/Edgewood, and PATH 400/Chastain Park Trails in Buckhead. Bicycling inside the City of Atlanta can be easy or difficult, depending on the neighborhood and route. The city is slowly making progress on building a comprehensive network of bicycle paths; however, Atlanta's bike infrastructure pales in comparison to some other US cities like Minneapolis and Portland. Bike rentals exist in the core of the city through Relay Bike Share. The eastern side of Atlanta is the most bike-friendly part of the city, with many bike lanes, parks, and trails. Atlanta is served by MARTA (Metropolitan Atlanta Rapid Transit Authority), +1 404-848-4711, , which operates both rapid rail and bus networks in the city of Atlanta and the counties of Fulton and DeKalb, and bus service only in Clayton county. Buses accept fares in cash, but cannot issue transfers on fares paid in cash — you must have a Breeze Card to obtain the transfer. Unlimited passes are available ($9 for 1 day, $19 for 4 days, $23.75 for 7 days). These will easily save you money if you plan on making more than one or two trips per day. The system is quite safe regardless of the time of day, although there have been a handful of incidents of violent crime in the last decade, mostly in the areas outside the stations and not in them. Like in any other city or transit system, use common sense, stay aware of your surroundings during low ridership periods, and avoid train cars with no other riders or with only a couple of other riders. The rail network is comprised of four lines: Red, Gold, Blue, and Green. The Red and Gold lines run north-south, while the Blue and Green lines run east-west, forming a cross with Five Points Station in the center. The Red and Gold lines run on the same rails from a southern terminus at Hartsfield-Jackson airport through Downtown and Midtown Atlanta, before splitting into two branches: the Red line runs to north metro Atlanta at North Springs Station, and the Gold line runs northeast and terminates at Doraville Station. The Blue line runs from a western terminal at Hamilton E. Holmes to an eastern terminal at Indian Creek. The Green line runs east-west along with the Blue line, but has a small spur to Bankhead station and only goes as far east as Edgewood/Candler Park station. The Five Points station in downtown Atlanta is the only station where passengers can transfer between all rail lines. Trains run from 5AM until 1AM Monday-Friday, and from 5AM until 12:30AM on weekends and holidays. Trains run on all lines every 12 minutes during peak periods, and every 20 minutes at night and on weekends. Note that the wait is often shorter than this for trips in the center of the city, as you will not have to wait for any specific train; you could take either the Red line or the Gold line to get from Downtown to Midtown, for example. The bus network comprises over one hundred different bus routes, with many routes operating approximately every 20 minutes. Bus service on some lines (generally including the most popular tourist areas) runs from 5AM until 1:30AM Monday-Friday and from 5AM until 1AM on the weekends and holidays. 110 "The Peach" – This bus traverses Peachtree Street/Road from Downtown to Buckhead. Although most trips along this corridor will be easier and faster using the train, this bus is still especially useful for getting to a destination between Arts Center Station and Buckhead, including the Buckhead Village, which is 20-minute walk from Buckhead Station. 36 – Useful connection to Virginia-Highland from Midtown Station. Beyond Virginia-Highland, this bus continues north and then east, stopping at Emory University, then traversing many residential neighborhoods before ending at Avondale Station east of Decatur. 16 – Leaves from Five Points Station in Downtown first eastward, passing the Carter Center, then turning onto North Highland Avenue and heading north to Virginia-Highland and beyond into the northeastern reaches of the city. Before turning onto North Highland Avenue, this bus runs roughly parallel to Highland Avenue in close proximity, and it follows North Highland Avenue through its most active areas, so this is a good route to get between destinations along that corridor. 2 – Leaves from North Avenue Station heading east and actually operates on two slightly different routes. Most of these follow Ponce de Leon Avenue and head briefly south and east along North Highland Avenue and Freedom Parkway before going along Moreland Avenue (through Little Five Points) and continuing to Edgewood/Candler Park Station. Once an hour, however, the bus will continue along Ponce (instead of turning down North Highland Avenue) and eventually reach Decatur Station. This route is useful for getting to parts of North Highland Avenue and to Little Five Points (both of which will be short walks regardless of which route the bus takes), and the hourly detour can be useful as well for reaching parts of Decatur which are further removed from the MARTA station. 12 – Leaves from Midtown Station and heads west along 10th Street past Georgia Tech. Turns north along Howell Mill Road and continues into far northwestern parts of the city. This can be useful for getting to the west end of Georgia Tech campus or for getting to the fairly recently developed West Midtown district (near Howell Mill and Marietta Street and continuing for some time along Howell Mill), where many restaurants, boutique shops, bars, coffee shops, and art galleries are located. 6 – Runs from Inman Park Station in the East to Lindbergh Station in the North. It first travels along Moreland Avenue (which becomes Briarcliff Road, on which it continues) with stops in Little Five Points (providing a shortcut there if the 10–15 minute walk is too much) offering short walks to much of Poncey Highlands. It also has stops at Emory University and the Centers for Disease Control. Note for weekend travel: MARTA runs slower on the weekends. Typical wait times are 20 minutes for trains and up to an hour for buses. Be sure to plan ahead and look at schedules. It is usually possible to flag taxicabs down near tourist attractions and bars in Midtown and Downtown. However, calling ahead is recommended. Flat rates to and from the airport are listed on Hartfield-Jackson International Airport's website . Be sure to insist on the flat rate, even if the driver claims no knowledge of it. Cars are the most popular form of transport to get around the sprawling city, and usually the fastest during non-peak hours. Many destinations outside the urban centers are only accessible by car. Rush hour peaks around 6:30 AM-9:30 AM and 3:30 PM-7:30 PM on weekdays and often results in congestion when traveling inbound in the mornings and outbound in the afternoons. Downtown/Midtown and major shopping districts such as Buckhead can also get crowded on weekends. In the most urban areas, many restaurants and shops in the area offer complimentary or low-cost valet services ($1-3 tip expected) and on the rare occasion where parking is scarce, public lots are usually nearby for a fee. In most of the city, though, parking is free and plentiful. Free road maps are available at . Real-time traffic information is available from the Georgia DOT at  or by dialing 511 from any phone. Street names in Atlanta are very confusing. There are more than 70 streets that have "Peachtree" in their name, and they are often difficult to distinguish (Peachtree Street, Peachtree Lane, Peachtree Circle, etc.). When someone says "Peachtree" without clarifying, they mean Peachtree Street, a major north-south thoroughfare through Downtown, Midtown, and Buckhead. They do not mean West Peachtree Street, which parallels Peachtree Street a block away. Making matters worse, Atlanta puts cardinal suffixes on every road, defining in which "quadrant" (used loosely) of the city the address is located. They are necessary; the same number is sometimes a valid address on two streets that differ only by their suffix. In practice, this isn't usually a problem, and most of the time locals don't bother listing the suffix, but if you see one listed on an address, assume it might be necessary, particularly when navigating with a GPS unit which will otherwise blindly route you into unsavory neighborhoods. Atlanta's top attractions form an eclectic mix that is sure to have something that appeals to everyone, and enough variety to keep the adventurous traveler busy. The highest concentration of exhibits can be found in Pemberton Place, where many of Atlanta's biggest attractions are located within two blocks of one another: World of Coca-Cola  tells the history of the world’s most iconic brand, with plenty of samples to ensure understanding; across the street is the Georgia Aquarium , the world’s largest by volume of water, where you can swim with the biggest fish of them all, the whale shark; and the CNN Center and Studio Tour, which offers a behind the scenes look at what it takes to run one of the nation’s leading news sources. Those more inclined to history can visit the Martin Luther King, Jr. National Historic Site in Sweet Auburn, which includes this inspiring leader’s birthplace home, his final resting place, the church where he once gave sermons, as well as a museum and memorial dedicated to his colossal achievements. A short ride on the Atlanta Streetcar will take visitors to the National Center for Civil and Human Rights, which focuses on Atlanta's pivotal role in the civil rights movement. Civil War buffs will enjoy the 100-year old Atlanta Cyclorama in Buckhead, which tells the story of the Battle of Atlanta through a massive, continuous, circular painting. The largest collection of Civil War memorabilia in the nation can be found at the Atlanta History Center in Buckhead, along side a large exhibit memorializing the 1996 Centennial Olympic Games. Exhibits of both ancient and modern history can be found near Little Five Points at the Fernbank Museum of Natural History, featuring a humbling display of the largest dinosaur ever unearthed, and the Jimmy Carter Library and Museum, which is the permanent home of the former president’s Nobel Peace Prize. The Michael C. Carlos Museum , located on the campus of Emory University is an excellent attraction for those interested in the Greek and Egyptian cultures. The museum houses the largest collection of Greek, Egyptian and Near East artifacts in the southeast. Those with more refined tastes can enjoy the High Museum of Art in Midtown, which displays fine art from the last two centuries, as well as modern and contemporary pieces. In Midtown, the Museum of Design Atlanta (MODA)  features rotating design exhibits and the Atlanta Contemporary Art Center  offers rotating contemporary art exhibitions. The Museum of Contemporary Art of Georgia (MOCA GA)  between Midtown and Buckhead features a permanent collection as well as temporary exhibitions of contemporary art, focusing on Georgia artists. Georgia State University's Rialto Center for the Arts  in Downtown has a free exhibition of visual art as well. The Atlanta Monetary Museum  at the Federal Reserve Bank and the Robert C. Williams Paper Museum  on the Georgia Tech campus, are both rather intriguing free exhibits on their respective themes. And finally, Gone with the Wind aficionados can’t miss the Margaret Mitchell House & Museum, which preserves the Tudor Revival mansion in Midtown where the Pulitzer Prize–winning novel was written. Travelers planning to visit multiple attractions may benefit from Atlanta CityPASS , which grants admission to 5 Atlanta attractions within 9 days of first use for a much reduced rate and includes expedited entry in some cases. The included attractions are: Georgia Aquarium; World of Coca-Cola; Inside CNN Studio Tour; either High Museum of Art or Fernbank Museum of Natural History; and either Zoo Atlanta or Atlanta History Center. All types of performing arts can be found in Atlanta, such as the Atlanta Ballet . Founded in 1929, it is the oldest professional dance company in America, the largest self-supported arts organization in Georgia and the official Ballet of Georgia. The company's performances combine contemporary and traditional styles with classic ballets and new choreography. Its annual season is presented at the historic Fox Theatre , including the holiday season favorite "The Nutcracker." The Fabulous Fox is worth a visit just to see its grandiose interior, and hosts many plays and concerts throughout the year. Opera fans can enjoy the Atlanta Opera . Atlanta's love affair with opera has spanned over 125 years of the city's history. Founded in 1979, the Atlanta Opera has won numerous awards both nationally and locally. The Atlanta Symphony Orchestra  is recognized for its creativity and innovation internationally. It is also known as a wonderful training ground for musicians who go on to stellar careers with other orchestras. Regular orchestral performances can also be caught at the new Verizon Wireless Amphitheatre. .
Atlanta has one of the most impressive theater communities in the United States with more than 65 active performance groups. Metro theaters present a variety of new and old works. The New American Shakespeare Tavern  is one highlight; this leading playhouse is the first troupe in America to complete the production of all 38 of Shakespeare's plays. Other highlights include Broadway musicals through Broadway in Atlanta  and Theater of the Stars , improvisation, southern themes, political and human issues, contemporary, classic and, of course, Shakespeare. Check out Alliance Theatre , Dad's Garage , Georgia Shakespeare Theatre , and Theatre in the Square . Explore the cityscape and enjoy the many pieces of architecture built all around Atlanta, from the skyscrapers of Midtown, to the Downtown skyline, to the houses on Highland Avenue, to the mansions of Buckhead. Inman Park, Atlanta's showcases the city's old Victorian architecture. Other notable architectural attractions include the High Museum of Art and The Jimmy Carter Presidential Library. Atlanta has a rich assortment of skyscrapers, notable for their modern aesthetic and the abundance of spires. The Bank of america building in midtown rises to a height of 1023 feet making it the tallest office building in the country outside of New York or Chicago. A recent building boom has left Atlanta glittering with dazzling glass skyscrapers, many of which contain some of the most expensive condominiums in the country. That said, the city owes a sizeable portion of its modern cityscape to home-grown architect John Portman. The construction of the icon Westin Peachtree Plaza Hotel helped steer Atlanta in a more urban direction. Portman, famous for the development of the hotel atrium also designed numerous other buildings in Atlanta, including the Hyatt Regency, the Marriot Marquis, and AmericasMart. Atlanta also has a few view points where you can enjoy a 360 degree view of the city in Downtown. One of them is the Sundial atop the Westin Peachtree. Another is the Polaris atop the Hyatt Regency Atlanta (its view is becoming obscured by the growing walls of glass around it), and there is also Nikolai's Roof  on top of the Hilton. 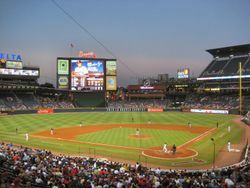 Atlanta Braves and Suntrust Park — The Atlanta Braves' regular season takes place April through September at the newly-built Suntrust Park in Atlanta. Atlanta Falcons at Mercedes-Benz Stadium (MBS) — The 1998 NFC Champions, the Atlanta Falcons, gear up each September to kick off the official season in Downtown. Replacing the Georgia Dome, the newly built stadium has a retractable roof, and capacity for 80,000 spectators. The Atlanta Falcons and Atlanta United (MLS) are playing the stadium's inaugural season. Atlanta Hawks and Atlanta Dream at Philips Arena — Covering 4.4 acres, Philips Arena is Atlanta's state-of-the-art multi purpose sports and entertainment complex located in Downtown. The arena is home to the NBA's Hawks and the WNBA's Dream. Georgia Tech Yellow Jackets — The city's most famous university features a popular and highly competitive sports program that competes in the Atlantic Coast Conference. All of the major venues, the best-known of which are Bobby Dodd Stadium for football, Hank McCamish Pavilion for basketball, and Russ Chandler Stadium for baseball, are on the Tech campus in Midtown. Atlanta Beat — The second incarnation of the city's women's soccer team joined Women's Professional Soccer in 2010. The Beat play their home games at a brand-new stadium, shared with Kennesaw State University, in the northern suburb of Kennesaw. Road Atlanta is a 2.5-mile road course located in Braselton and is host to many major racing events, including "Petit Le Mans", an annual ten-hour endurance race that features world class cars and drivers. One day in Atlanta — This busy one-day tour will show you the many sides of Atlanta. Old South and New South — This tour takes you through the old historical sides of Atlanta and the new rapidly growing areas with postmodern architecture and technology, as well as unique culture. The Walking Dead Tour — This busy one-day tour will show you the many sites where the hit TV Series "The Walking Dead" were filmed. Visit Centennial Olympic Park  in Downtown and relax by the man-made river, splash in the Fountain of Rings on a hot summer day or go ice skating at the ice rink in the wintertime, attend a concert, and pay respects to the victims of the 1996 Olympics bombing. Walk through Piedmont Park in Midtown, the largest park in Atlanta. Attend the Dogwood Festival in the spring time or one of the many musical events. Grant Park is the oldest city park in Atlanta and is home to Zoo Atlanta. Historic Oakland Cemetery, also located here, serves as the final resting place for more than 3,900 Confederate soldiers, famous author Margaret Mitchell, golfing legend Bobby Jones, six Georgia governors, and 25 Atlanta mayors. Stroll down the Atlanta BeltLine Eastside Trail, which has become the de facto boardwalk for the city, with restaurants, bars, shops, and a skate park adjacent to the trail. In January and February, look for the city-wide celebration of visual arts with ATLart  and enjoy an early spring at the Southeastern Flower Show  held at the Cobb Galleria Centre. In March, Atlanta celebrates Irish Heritage with Downtown Atlanta's St. Patrick's Day Parade and Festival,  followed, in April, by the Atlanta Dogwood Festival  staged at Piedmont Park with children's activities, an artist market, and more. The Georgia Renaissance Festival  allows people to experience merry olde England during the days of King Arthur. The Inman Park Festival is one of the city's most popular spring festivals, with live music, art, and a whacky parade. It is held during the last weekend in April. Each May celebrates jazz in Atlanta, the Atlanta Jazz Festival  is presented at the Woodruff Arts Center and other venues. In June, visitors can experience the Atlanta Film Festival. The Georgia Shakespeare Festival  presents plays from June through October at the Conant Performing Arts Center at Oglethorpe University. The days around Independence Day (July 4) are filled with quite a few celebrations, but the most notable is the Peachtree Road Race, with 55,000 runners and many more spectators. The National Black Arts Festival  is held during the third week in July and is the world's largest cultural celebration of African-American art. Dragon*Con , held for 4 days over Labor Day weekend, is a massive science-fiction and fantasy convention, although it's grown to be so multi-media and multi-genre that almost anyone can find a topic of interest here. Celebrity actors and writers come from across the world for Q&A panels. The convention is spread across 4 or 5 hotels downtown. Admission is pricey, starting at $40 for 2 days up to $120 at the door for an all-weekend pass. Walking through the hotels is free, though (you just can't attend any panels or enter the dealers' rooms), and the Costume Parade is not to be missed, whether you're on the lookout for Klingons, Storm Troopers, or hobbits. The Atlanta Pride Festival  is an October three-day celebration of gay pride held in Piedmont Park. Atlanta Celebrates Photography  promotes photography exhibitions and events citywide every October. Chomp and Stomp Chili and Bluegrass Festival occurs on the first Saturday of November in the historic Cabbagetown neighborhood. $5 gets you a spoon to try an unlimited amount of chili. Bluegrass musicians perform throughout the day on stages throughout the neighborhood. Atlanta has one of the top 10 retail markets in the US, and the city's neighborhoods are a great place to find antiques, art galleries, arts and crafts stores, thrift stores and boutiques. The city's eclectic shopping neighborhoods include downtown Atlanta, Little Five Points, Virginia-Highland, Buckhead and Midtown. Looking for antiques and art? The Miami Circle,  Street,  and The Galleries of Peachtree Hills  offer some of the best merchandise in Atlanta. Buckhead is home to more than 1,400 retail stores. Lenox Square  and Phipps Plaza  offer the most concentrated collection of upscale stores available anywhere in the city including Barneys CO-OP, Neiman Marcus, Tiffany & Co., Jil Sander, Gucci, Cartier, Burberry, Jimmy Choo and Louis Vuitton. The Midtown Mile  is a stretch of Peachtree Street in Midtown that offers street level retail shopping. It's on schedule to be complete in 2009, but many shops are currently open. Atlantic Station  also offers plenty of retail options. If your interest lies in smaller, specialty, boutique or vintage stores, try Little Five Points, Virginia-Highland, and East Atlanta Village. Wax 'N Facts is a popular store in Little Five Points that actually still sells vinyl records. Bill Hallman Boutiques are also a neighborhood staple, providing fashion forward clothing for Atlanta's social set. Underground Atlanta  is six city blocks in the heart of downtown Atlanta transformed into a spirited marketplace that offers historic guided tours and features restaurants, specialty stores, entertainment emporiums, and street-cart merchants. Street vendors are common in Downtown, especially in the Five Points neighborhood. You can also find large assortment of trade retailers at AmericasMart. Foreign Exchange. Note that there are only 2 FX locations in all Atlanta. One is at the airport and the other is in Lenox Mall (bottom floor, after food court). Lenox Mall is at Lenox MARTA station, gold(yellow) line (northeast end). The exchange rate given in Lenox Mall was pretty bad, being only 83% of the mid rate [2014-09-10]. I cannot comment on the Airport FX rates. Affordability, variety of restaurants, culinary diversity and award-winning chefs are key ingredients that earn Atlanta a place at the table with other popular culinary cities. An assortment of neighborhoods offers an array of restaurants featuring cuisine that spans the globe, serving something for every taste. During the past few years, several celebrity chefs have traveled south to call Atlanta home. Drawn to the quickly growing culinary scene, these chefs have been welcomed with open arms and some true southern hospitality. Atlanta is home to the headquarters of restaurant chains such as Waffle House , Chick-Fil-A , Zaxby's , Krystal , Mrs. Winner's , Moe's Southwest Grill , Shane's Rib Shack , and Arby's . The dominant local grocery chains in Atlanta are Kroger, Publix, and Aldi. The city is also dotted with dozens of ethnic groceries, especially Hispanic, Korean, Indian and Vietnamese. For organic and or specialty grocery stores both Whole Foods Market, Trader Joe's, and Fresh Market also have locations throughout the city. In much of the South, and particularly in Atlanta, all soft drinks are referred to as "Coke." Due to the ubiquitous advertisements and broad popularity of the product, Coca-Cola has transformed the modern southern colloquial for anything carbonated into simple "Coke." If you sit down and order a "Coke," expect to be asked "what kind?" This cultural practice is maintained even to the extreme of ordering a Pepsi by saying "I'll have a Coke...a Pepsi please." The epicenter of this peculiar practice is Atlanta of course, because the world headquarters for Coca-Cola are downtown. A true staple of southern culture, sweet tea can be found at almost any restaurant in Atlanta. In most places an order for "tea" will be assumed to mean "sweet tea"; hot or unsweetened tea need to be asked for specifically. A popular variant to a glass of sweet tea is an arnold-palmer, a half and half mix of iced tea (either sweetened or unsweetened) and lemonade, named after the famous golfer who popularized it. "Arnold-palmer" is a bit of a tongue twister, so ordering a "half iced tea and lemonade" is common. With fun and unique attractions, renowned restaurants and top-of-the-line hotel experiences, Atlanta keeps the party going from day to night. With chic style in Buckhead, alternative scene in Little Five Points, a casual atmosphere in Virginia-Highland and a trendy vibe in Midtown, Atlanta nightlife suits every style of letting loose. Since each district has so many options, you will want to visit each discrict article for a more detailed listing. Buckhead is a popular nightlife district for locals and out-of-towners alike. Andrews cafe  are among the most popular dance clubs in Buckhead among 20's and 30's singles, while an older crowd can be seen at the Beluga Martini Bar. The Buckhead clientele is mostly of an upscale crowd, so be sure to dress to impress. 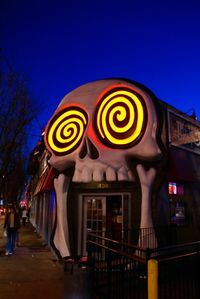 For the more alternative/hipster crowd, East Atlanta Village (EAV) is the place to go for live music and inexpensive drinks. However, EAV can be difficult to get to for visitors without access to a car. The Sweet Auburn district, just East of Downtown and easily accessible via the Atlanta Streetcar, has become a very popular nightlife area in recent years. Edgewood Avenue hosts a diverse and eclectic set of bars and clubs. Sister Louisa's Church of the Living Room and Ping-Pong Emporium is a must-see for visitors to the district. The street's bars and clubs are frequented by a diverse clientele from all walks of life. Midtown is the spot if you're looking for the urban vibe with diverse a crowd of 20's and 30's, many of them are college students, locals, transplants from out of state and foreign countries. Downtown has a few options for nightlife as well. The Fairlie-Poplar district has a few neighborhood bars, and the Luckie-Marietta district is usually lively with a variety of restaurants and bars clustered around Centennial Olympic Park. Stats  is an ideal sports bar to watch a game located near Centennial Olympic Park. Other popular clubs throughout the city include The Masquerade  and MJQ Concourse. All areas of the city also have plenty of pubs and taverns, such as Fado Irish Pub Fado  in Buckhead, Shakespeare Tavern  in Midtown, and Highland Tap  in Virginia-Highland. All nightlife parts of the city are gay- and lesbian-friendly. However Midtown has the largest concentration of gay/lesbian nightlife establishments. If you like country line-dancing, you can head out of the city and into the suburbs and check out Wild Bills  in Duluth. See the Districts articles for more listings. Most of Atlanta's major hotels are located downtown between Five Points and Midtown in area with a name that is easy to remember: the Hotel District. The district is in the heart of Atlanta's economic and political center and is within walking distance to many of the major tourist attractions, including the Centennial Olympic Park, the World of Coca-Cola, the Georgia Aquarium, and the CNN Center. Rapidly growing Midtown, the center of Atlanta's business district as well as many high-rise luxury condos is nearby many museums and theaters. If you're looking for boutique hotels that are near a thriving urban setting, Midtown may be the area for you. Once the heart of Atlanta's nightlife, Buckhead is still home to several upscale hotels, which are close to the area's shopping and dining districts. If you're staying in Atlanta without a car, you'll have the best time if you stay around Midtown or Downtown, which offer central, easy access to MARTA. Both areas have many excellent bars, restaurants, and cultural attractions accessible by foot. The big-name hotels in these parts of town are close to train stations and bus routes, making access to most interesting parts of town quick and hassle-free. Buckhead and Decatur Buckhead are other options with good access to transit, but not as many tourist attractions in the area (and in the case of Decatur, not many hotels to choose from). If you plan on renting an apartment, good places to look include Midtown a few blocks from Peachtree Street between the Arts Center and North Avenue MARTA stations, and around North Highland Avenue south of Virginia Avenue (including Little Five Points). Despite Atlanta's reputation, the city is not as dangerous as many perceive it to be. The crime rate has dropped during the late 1990s and 2000s and reached a near forty-year low in 2005. While violent crime levels are still high compared to most American cities, most of the violence is related to the drug trade, and takes place in parts of the city visitors seldom see. Usual precautions should be taken, as in any other major city, such as not traveling alone at night and being aware of which neighborhoods are more prone to crime. In Atlanta, the southwest and southeast areas have reported the most incidents of crime; the triangle created by I-285, I-75, and I-20 in particular is a dangerous neighborhood, as well as west of Northside Drive around Georgia World Congress Center and Georgia Dome. Car theft is exceptionally high by national standards. Also beware of frequent car break-ins in downtown. Do not leave anything valuable in plain sight in the car (even your old GPS that might be worth just $20). Outside of the perimeter, crime rates are significantly lower (except Dekalb County). Atlanta area codes are 404, 770, 678, and 470. All 10 digits of the phone number are required when making local calls. Atlanta Journal-Constitution The city’s main newspaper that is read throughout the city, state and various places such as university libraries across the nation. Creative Loafing An alternative, free weekly newspaper which focuses on lesser-known news as well as movies and local events ranging from current theatrical productions to concerts and exhibits. Mundo Hispanico Spanish-language version of the Journal-Constitution. Atlanta Business Chronicle Atlanta business news. Atlanta Cho Son Atlanta's Korean language newspaper. In Atlanta vernacular, "ITP" refers to everything inside I-285 which makes a loop around the city's far edges. A few cities, which are distinct from Atlanta proper, also reside ITP. Decatur is easily mistaken for an in-town neighborhood of Atlanta , but is in fact the largest of Atlanta's neighbors and sits a quick 15 minutes east on Dekalb Ave. Decatur has retained its small city feel and relaxed pace, despite its proximity to the giant metropolis. East Point is home to many well known hip-hop and R&B groups as well as a burgeoning fine arts community, and is located south-west of Atlanta's neighborhoods. College Park is a small town south of East Point and adjacent to Hapeville and the airport in South Atlanta. Picnic next to some exposed granite? Anyone? Many towns in the greater Atlanta area reside "OTP" but remain closely associated with the city. Marietta is half an hour north-west on I-75 and home to Marietta Gone with the Wind Museum and Six Flags White Water. Kennesaw is just beyond Marietta on I-75 and is home to a Civil War battlefield, Kennesaw Mountain National Battlefield Park in addition to Kennesaw State University and the Museum of History and Holocaust Education. 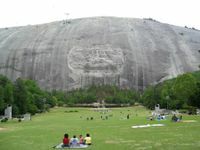 Stone Mountain is one of Georgia's most unique attractions, and is just half an hour to the east. Visitors can hike up the mountain or take a cable car to the top. Austell is half an hour to the west and is home to Six Flags Over Georgia. Goliath, the tallest roller coaster in the Southeast, can be found here. Helen — A mountain town created to resemble an Alpine village. Popular in the fall for viewing autumn leaves, and the largest and longest Oktoberfest in the Southeast. Also neaby is Unicoi State Park and Anna Ruby Falls, as well as Sautee-Nacoochee Valley. Dahlonega — Once the location of Georgia's own gold rush. Visit the Dahlonega Gold Museum and try your luck finding some of your own gold. Also located in Dahlonega is Wolf Mountain Vineyards , which offers a perfect get-away to taste award winning wines and enjoy a beautiful scenery. The vineyards and winery provide the perfect setting for Sunday brunch, café lunch, and gourmet dinners. Savannah — A 4 hour drive, but well worth it. The downtown is a historical district with many parks, squares, and historic architecture. Hampton — Home to the Atlanta Motor Speedway, an 870-acre racing complex hosting NASCAR Sprint Cup, Nationwide and Craftsman Truck Series events in March and October. In addition to the race weekend, the facility hosts events ranging from driving schools, Thursday Thunder Legends racing, Friday Night Drags, Car Shows and many others. Chatahoochee River Fun — Sixteen recreation areas along a 48-mile stretch of the Chattahoochee River  have been designed to conserve the river and provide outdoor entertainment for the whole family. In addition, the Chattahoochee Nature Center in Roswell offers education environmental programs, canoe trips and other recreational activities. Outdoor Adventure Club of the South — Atlanta's premiere outdoor adventure and social club. OAC South  offers dozens of outdoor and social events around the metro Atlanta area every month. Hiking, biking, backpacking, climbing, water sports, and more. Lake Lanier Islands — The closet beach to Atlanta can be found at Lake Lanier Islands Resort , with its lakefront beaches, water park, golf courses, boating, spas, and more. Château Élan Winery and Resort , a 16th-century-styled French retreat, is just 30 minutes north of Atlanta in the town of Braselton, and has a festive atmosphere that encourages guests to tour the vineyards, visit the winery, have lunch at a sidewalk café and play a round of golf. Barnsley Garden Resort — Barnsley Garden Resort  is a beautiful hotel and resort in Adairsville, Georgia with lush gardens, cabins and a Zagat-rated golf course. Callaway Gardens — Located in Pine Mountain, Georgia Callaway Gardens  is a premier vacation spot with tons of activities for the entire family. This page was last edited on 1 March 2019, at 15:41.